Dream Defense update: Happy holidays! It’s been three weeks since we launched Dream Defense on the App Store and Google Play, and now we’re back with some holiday goodies in our latest update! In this update: A Santa skin for Robearto, daily quests, and new stuff at the store! Skins – You can now change Robearto’s appearance by equipping the Santa skin! Get the skin for free by completing daily quests (see below). We’ll have more skins in our next updates, so this is just the beginning! Daily quests – You can now earn more rewards as you play by completing daily quests. Tap on the Quests icon on the map to see your quests for the day. Complete all three and get a Skin Shard; collect enough shards to unlock the Santa skin for free! Earn more rewards by completing daily quests. Finish all quests to get a Skin Shard! Coin and ore doublers – Double or nothing! Buy ammo and upgrades faster by buying coin and ore doublers, which double your earnings permanently. Check them out at the Specials tab in the store. 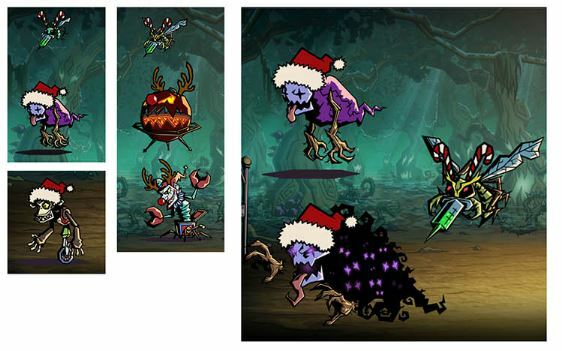 Holiday-themed enemies – Who says monsters can’t have some holiday spirit? Robin’s enemies are all dressed up in festive costumes during the holiday season. Don’t let their appearance fool you, though; they’re still dangerous! Bugs & performance fixes – We’ve fixed some bugs and improved the game’s performance based on your feedback and comments. Thanks, guys! This is just the first of many Dream Defense updates to come! We’ve got more items and skins in development so make sure to watch out for those. As always, every comment helps shape our updates, so please keep them coming. Until next time, defenders!